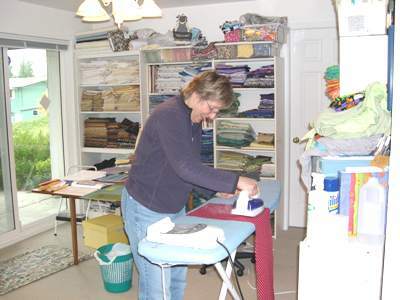 Two of my friends, Joan and Doreen, arrived Friday morning with a car full of fabric for a mini retreat on the weekend – wow, we had so much fun! 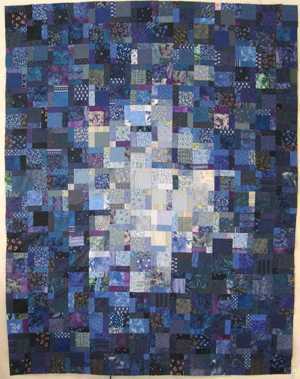 It is so great to get a few quilters together, the creative juices flow, the wine flows, and the giggles go crazy. 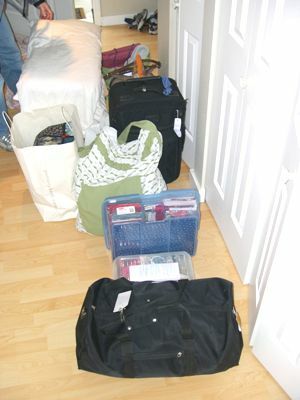 They had so much stuff my husband thought they were moving in!!!! We started by sitting down with a cup of tea and hot-out-of-the-oven Apple Cinnamon Muffins. After tea we went to the studio and began cutting and sewing and getting caught up on family stuff. 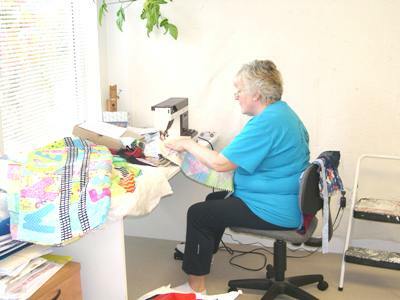 Doreen was making backings for several of her quilt tops so she could get quilting them. Joan was adding blocks to a previously started top, and I was sewing the rows together for my granddaughter Mackenzie’s quilt. We did stop for lunch, a quick walk up the hill with the dog, and dinner, but kept sewing until about midnight. Saturday we continued sewing, pressing, cutting. Joan finished her green and pink top and needed to go look for borders, so off we went to the local quilt shop. We had a great time, coming back with even more fabric. More cutting, sewing, pressing – I finished the Twisted Nine-Patch top I started at our last retreat and Doreen put together a little wall hanging kit from New Zealand. 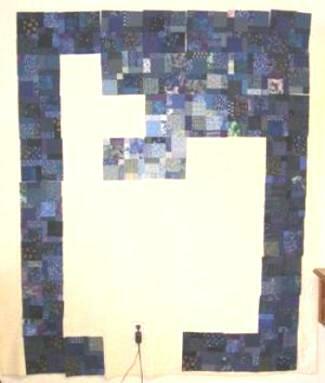 Joan started her little sailboat quilt (maybe it is for her new wee grandson). We went out for dinner, then came back to sew some more. 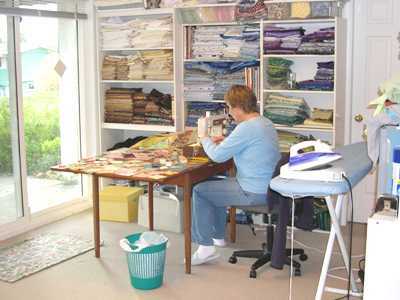 Doreen was now cutting her strips for the next big project. We stayed up until about midnight with lots of laughter. This is my Twisted Nine Patch in progress and...complete!!! Whooo Hoooo!!! 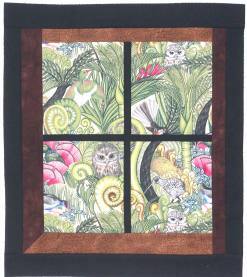 ...and this is Doreen's beautiful Kiwi wall hanging. Sunday was more of the same. 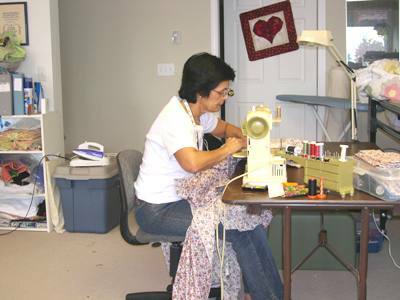 Doreen kept cutting strips, and Joan was making more sailboats. 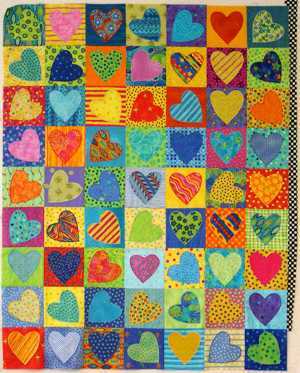 Having completed two UFO’s, I then searched for the next one to do, and came across the colorful hearts that had been on my wall in my previous house a couple of years ago. I decided to sew them together and give them to my granddaughter too. Didn’t get the borders on before the girls had to leave to catch the ferry home, so it is still a UFO. As always it has to end. But it was a very productive weekend, with lots of bonding and giggling as well as sewing and cutting. Can’t wait for the next one! Finished with "Retreat Oct 2007"? 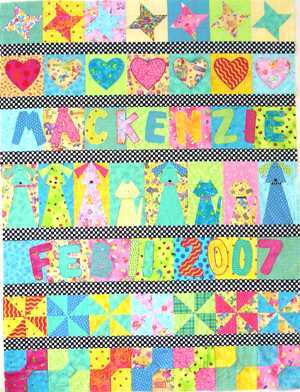 Return to Quilting Retreats Or Return "Quilt"